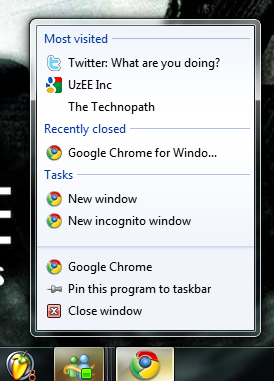 The latest developer build of Google Chrome gets Jumplist support in Windows 7 â€“ and that too against all my expectations. I was hoping that the recently released Firefox 3.6 Alpha 1 would have Jumplists support before any other browser like Google Chrome, Opera or Safari â€“ but I guess I was asking for too much. The Jumplist tasks arenâ€™t very different from what you get on Internet Explorer or Firefox with WinFox installed. You can open a New Window or a New Incognito Window for hassle free p0rn. And you also get the usual MRU lists as well â€“ something which I have never personally used myself. Even though Jumplists is a pretty useful feature, I havenâ€™t run into any third party application making good use of it. Oh and Google Chrome has only added support for Jumplists yet, not Aero Peek, so donâ€™t get your hopes too high. Coupled with a ton of other UI updates, Google Chrome 3 is looking out to be one hell of a browser, though it still wonâ€™t take Firefoxâ€™s place on my machines.